When do RCDP programs start? RCDP volunteer programs begin on the 2nd and 4th Monday of the month. Programs last from 2 to 12 weeks. You don't necessarily need to start on these dates for you if they are inconvenient. How can I get to the site from the airport? An RCDP representative will be waiting for you at the airport holding a sign with your name on it. Make sure to send along to us your arrival information at least four weeks before you arrive. Your pre-departure guidebook features contact details and maps. What if something goes wrong, such as a delay in my flight, I am unable to find my contact at airport, or if there is some kind of emergency? If you arrive later than you anticipated, go to the contact hotel, the details for which are in your placement sheets. Call the coordinator so that you can be picked up the next morning. The pre-departure guidebook has telephone numbers of the country coordinator and emergency contacts. You should stay in a hotel if you arrive more than one day early than the start of your program. All volunteers will work on the tourist visa in Xi'an, China. Please remember there is no volunteer visa. You will have to apply for a visa before departing for Xi'an, China. Please apply in the embassy for your country. It is your responsibility to arrange your visa and the flight. Please contact us, if you need any further information on getting the VISA and you can also find more information in the pre-departure guidebook. How is RCDP better than other volunteer organizations? RCDP very simply offers high-quality abroad experiences at a fraction of the price than other organizations charge. Custom-tailored projects are available. Where do all of these volunteers come from? Most RCDP volunteers are from Western countries such as the US, Canada, Australia, the UK and elsewhere in Europe. In particular, volunteers come from universities, church groups, youth groups, etc. Members of a single family often volunteer together. What language skills are required to take part in an RCDP program? Only English is required to volunteer. But we do encourage volunteers to learn little bit of local language so that you can work more effectively. 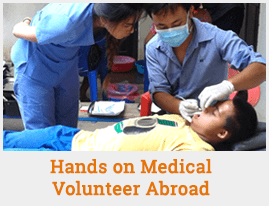 Need I be an experienced volunteer in order to join an RCDP program? Only the healthcare projects require experience in the field. In general, volunteers are only expected to be full of energy they want to share with others, and concerned about improving their lot in life. Is it possible to volunteer with a friend, as a couple or in a family? Certainly. We are able to accommodate twosomes or threesomes of the same gender or couples, and will do our best to place families together as well. Can I take part in a second project at the same time as the first? Yes. RCDP wants its volunteers to go away happy to have made a difference, including in two projects if they wish. If I am unhappy about my project, can a new one be arranged for me? A change of placement takes place only under extraordinary conditions. RCDP will consider a new placement for volunteers if they encounter significant problems. If I need to leave before my project is over, can I get a partial refund form the program fee? No. Volunteers are strongly encouraged to volunteer throughout the duration of their scheduled time period. Field conditions can change for the worse if volunteers come and go as they please. RCDP offers volunteer projects like orphanage work, teaching English, panda conservation, special need's children project and summer camp. If you want to volunteer with RCDP International and gain incredible experience of helping grassroots communities thrive, please apply at www.rcdpinternationalvolunteer.org/apply.php. Please make sure you know which program you are volunteering and how long you want to volunteer before filling up the form. For details, please visit www.rcdpinternational.org. Step 1: When RCDP receives your email; we will send a reply within 48 hours, along with an attached file containing an application form; alternatively, you can download the application form. Step 2: When we receive your application, we will notify you immediately. Please give us 3 weeks to process your application and match your placement. We will send you a notice of preliminary acceptance and a pre-departure booklet within 3 weeks. Step 3: Once you receive your project/placement details from RCDP, you should begin preparing for travel by obtaining all necessary documents (passport, visa) and meeting immunization requirements. Step 4: Participants can fax/mail a photocopy of the front page of their passport and flight itinerary to our head office in Katmandu. Step 5: Our in-country coordinator or an office representative will pick you up at the airport and take you to your placement destination. You can make payment upon arrival in Xi'an. As soon as it is received, your application will be forwarded to the volunteer country for processing. You will be placed in a position appropriate to your experience and desires. You will hear back from the in-country coordinator within two weeks. Get ready for your voyage by reading about the country, getting vaccinations, securing a visa and booking air tickets. Feel free to contact the RCDP office if you encounter any problems. Send RCDP your travel details as soon as you get them. You will be met at the airport by an RCDP employee holding a sign with your name on it. If your flight is delayed or if you miss your flight and book yourself on a later flight, do let RCDP know by telephone. If you cannot find the RCDP staffer, take a taxi to the hotel listed in your placement paperwork and call us to arrange pickup from there. Try to arrive one day before the start of your program. You need to pay a nominal fee if you arrive or leave outside the general travel time. Usually, volunteers live with a host family in a separate room. You will eat local meals with the host family three times a day. We suggest vaccinations against public health threats and other communicable diseases. Please refer to CDC website: wwwnc.cdc.gov . Routine: if you are not up-to-date with routine shots such as, measles/mumps/rubella (MMR) vaccine, diphtheria/pertussis/tetanus (DPT) vaccine, polio virus vaccine, etc. The safety of our volunteers is our first priority. There are many layers of support for you in Xi'an. You will get support from the country coordinator, project directors/staffers, host family, your embassy, and our Xi'an, China office. However, your main support comes from our in-country coordinator. Our in-country coordinator is a full-time position specially created to support and help our volunteers (at any point for any reason). In Xi'an, we work with terrific country coordinators. They are mature, educated, socially respected, and having long history of working with international volunteers. There are plenty of Internet centers in Xi'an, China from where you can email or phone your friends and family home. You will be able to easily send and receive emails and call internationally. You can also use a mobile phone. If you bring a mobile phone that is SIM card compatible you can get a SIM card and Chinese mobile number for approximately $30 which is great for keeping in touch with other volunteers and also home. You will be guided on this during orientation.